Comite de Bien Estar, Inc.
About Comite de Bien Estar Inc.
Bienestar Apartments I is an affordable rent apartment community consisting of 92 units, 44 two-bedroom and 48 three-bedroom units. 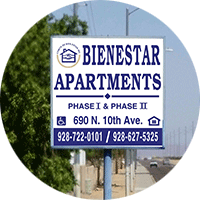 Bienestar Apartment II is an affordable rent apartment community with 64 units, 8 one-bedroom, 24 two bedroom, and 32 three-bedroom units. Las Casitas Apartments is an affordable rent apartment community consisting of 76 units, 44 two-bedroom and 32 three-bedroom units and is managed by BMG Property Management, Inc., a subsidiary of Comite de Bien Estar. 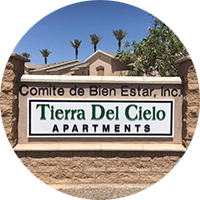 Tierra Del Cielo Apartments is an affordable rent apartment community subsidized by USDA Rural Development and Farm Labor Housing. Las Brisas Sunset Apartments is an affordable rent apartment, 55+ community. At all the properties except Tierra Del Cielo, rent is determined by a designation set by the Arizona Department of Housing. Rent is not determined by income but families must be income eligible to live at these properties. No. Applicants are placed on a waiting list in chronological order. The waiting period is about 6 to 12 months. In person, submitting an application by mail or email. © Comite de Bien Estar, Inc.